What made Althea Simms (1898-1992) open the page of a blank fisherman's union finance book on a foggy day in June 1929 and begin a daily record of life, work and weather on Fogo Island? Maybe she wanted to tell her story for future generations, or maybe she kept the diary just for herself, a daily ritual that marked the end of every day and anticipated the next. January 6th, 1934: Started making casks. Fine not as cold. Was out to Oakes in night. Had mummers in. Andrew Lodger died. Wind S.W. Titus went to Church. Although her words are always careful, Althea hints at greater social drama in her entries. She lives in a world where visitors arrive and depart in a constant stream, mummers stop in throughout the months of December and January, a sealing disaster marks the beginning of spring, while four ships drive ashore in August and yet life moves forward with nightly card games to join, dances to attend, couples being wed, berries to pick and potatoes to be dug and stored at the onset of fall. Like a sea captain's log, there is always a description of the weather and its effect on the community. November 5th 1929: Raining. Too wet for Bon Fires. While Althea pays special attention to the people in her own life including her husband Guy Simms (1901–1986), and close friends Lizzie and Titus Jones, the diary also acts like a community census. The yearly diaries are a meticulous account of the births, deaths and marriages on the island. Even those who lived but a few short days are recorded here, and live on, in Althea's diary. February 7th, 1942: Mild. No Wind. Mrs. Waterman bit better. Eric Bennett's child buried. Lots of snow. Further, Althea's diary records history in real time, illustrating the changes taking place as Newfoundland rolled towards confederation with Canada. In a hint of what lies ahead, Althea notes that the first "overland mail" arrived at her doorstep. January 13th, 1932: Fine day. Not a bit cold. First overland mail came. 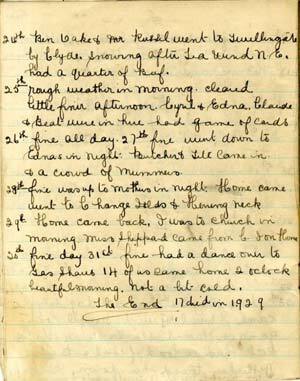 Some highlights of Althea's diary entries can be viewed at Selected Entries.